Sir Stackabrick is a The LEGO Movie minifigure released in 2014. 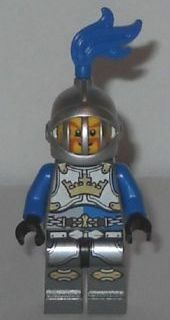 He appears in the set 70806 Castle Cavalry. Along with Gallant Guard and Hank Haystack they are the only Middle Zealand characters in the movie. Sir Stackabrick has a yellow head like most of the other The LEGO Movie minifigures, except for Batman. He has an orange printed beard, bushy eyebrows and white pupils. He is wearing a knight helmet in metallic silver with a fixed face grill. He has a blue plume attached to his helmet. His torso is mainly blue and silver, with a a printed silver breastplate and a golden crown printed over it. There is a gold buckle at each of the breastplate's corners. A silver chain belt with a brown and gold buckle is printed below the breastplate. His arms are blue, and he is wearing black gloves. His legs are grey with a gold kneepad pattern, lined with silver. An extension of his belt is also printed at the top of his legs. he has silver armor printed just above the kneepads. This page was last edited on 12 January 2016, at 23:51.